“Dems ready to move past Michelle Obama’s ‘go high’ message” [The Hill]. “[Michael Avenatti], said former Rep. Steve Israel (D-N.Y.), is ‘tapping into a Democratic rage that Trump must be defeated and it doesn’t matter how.’ ‘They think the low blow beat the high ground in 2016,’ Israel said, adding that Trump has created ‘an electorate that is angrier, nastier and more desperate.’ That likely means more attacks and a pugnacious 2020 primary season, say Democrats. ‘We have no other choice,’ said one political strategist who has been having preliminary conversations with candidates about running for the presidency. ‘You can’t kill him with kindness. That doesn’t work. So you have to go the other way. '” • (Sanders supporters smeared by liberal Democrats as racist and sexist bros may be dubious about liberal Democrats’ professed reluctance to take the low road.) Let’s remind ourselves that Steve Israel, during his tenure at the DCCC, was the architect of the Blue Dog-centric strategy that lost the Democrats 1000 seats and all three branches of government; see Down with Tyranny for a fun post on “The Steve Israel effect.” So Israel’s a loser, and probably any strategy he recomments will be a losing one. Then, two solid years of RussiaRussiaRussia! was treating heck, not Trump, but the entire country, with kindness? Donning my tinfoil hat: We might ask ourselves to whom this signal, if indeed it is a signal, is being sent, given the enormous investment by both the political class and the politicized factions of the intelligence community in RussiaRussiaRussia. Sounds to me if RussiaRussiaRussia is all that liberal Democrats have going for them — the donor class certainly won’t let them do anything halfway decent on policy, even if they were so inclined — then RussiaRussiaRussia will have to be intensified. Maybe, after the big reveal, we’ll be arguing about fonts, or today’s digital equivalent, all over again, for most of 2019…. A pleasing prospect, and all, if Israel is in form, for nothing. Fortunately, there aren’t any major players in the controversy with the operational capacity to fabricate evidence. Oh, wait…. “Estrich: Donald Trump numbers not as bad as some believe” [Susan Estrich, Boston Herald]. “The big problem on my side of the aisle these days is that so many people hate Trump so much that they cannot acknowledge his strengths among voters and simply cannot believe he could possibly win. And in this, they are sadly wrong. Not only could Trump win; he probably will if Democrats remain locked in a state of denial. Trump has at least three big advantages… First and foremost, it’s the economy, stupid…. Second, as my father used to say at the track, you can’t beat a horse with no horse…. That brings me to the third reason, which my friends just hate. I’m sorry, Donald Trump may be many things, but he is not stupid. He is not in over his head; he’s been swimming along just fine. He is shrewd. You don’t get to be president without being shrewd. Blame former FBI Director James Comey, but Trump took some hard hits, too. Looking forward, you might try to convince yourself that the problem was Hillary Clinton, that she lost. I don’t see it that way. Clinton fought hard. Trump won. And he could do it again.” • Estrich was Michael Dukakis’ campaign manager…. “Pelosi Might Not Be A Great Leader Any Longer But Most Of The Members Who Want Her Position Are FAR Worse” [Down With Tyranny]. “There are plenty of ambitious, far less talented, far more conservative Democrats who [see] themselves as speaker.” • Hard to believe, but true. Interesting for the circumlocutions all candidates, including those on the left, must use to keep their options open. Oh, and: “We have a Republican Party controlled by conservative billionaires; we don’t need a Republican-lite party controlled by conservative billionaires on top of it.” • Billionaires as such, surely? The Times omits Cook’s classification of districts (“Trump Surge zones,” etc.). Perhaps the Times didn’t like those categories much, either? MO: “Wesley Bell’s Win Surprised Everyone — Except His Campaign” [Riverfront Times]. “A generation of St. Louis County voters had returned McCulloch to office again and again, and some observers speculated that Bell’s campaign would turn those voters off with talk of bail reform and respect for protesters. In reality, though, Bell didn’t need McCulloch’s voter base. He had his own… ‘People are waking up,’ [ActionSTL leader Kayla Reed] says. ‘They always try to say that the ‘Ferguson Effect’ is a bad thing. This is the good part of the Ferguson Effect, this is what it’s all about. Making sure that we elect people that represent people’s interests, the people’s morals. Young people running for office, changing the guard in these officers that have been held by the same person for decades. '” • For anybody who remembers Ferguson, this is a big, big deal. MO: “The historic election of Wesley Bell, movement-building, and a few essential lessons we learned in this groundbreaking race” [Medium]. “At first I didn’t quite get what [Philadelphia DA] Larry [Krasner] meant, but he unpacked it, and so did the other brilliant panelists. Electing radical reformers as district attorneys is HUGE. It’s essential. It’s a BFD. But it’s not everything — if you have a great DA, but horrible judges, you are still jammed up. If you have an amazing DA, but a horrible police chief, problems will continue. If you have an amazing DA, but the House, Senate, Presidency, Supreme Court, and most state legislatures are working against you, you simply don’t have enough. What Larry was saying is that if we turbo-charge our local, regional, and national organizing we can not just elect great district attorneys, we can change the whole game. And to have the results we really need, we have to change the whole game.” • Yep. NY Governor: “Letitia James Has Embraced Andrew Cuomo. Is It Worth It?” [New York Times]. James: “It’s really, critically important that I not be known as the ‘Sheriff on Wall Street. '” • Oh. “The handwritten notes exposing what Fusion GPS told DOJ about Trump” [John Solomon, The Hill]. • I don’t have much to say about this, except to note that Obama’s intelligence community is treated as being a remarkably passive player in the whole RussiaRussiaRussia narrative. So it’s good to see some, er, dots connected between (Democrat vendor) Fusion and Obama’s Justice Department (plus the FBI) [hums “Moody Richard”…]. Reader Query: I’m trying to remember the name of the Kos employee who invented the business model of taking a commission on click-throughs for online petitions; this probably would have been after the Dean campaign in 2004. But I can’t. The name was well-known in the blogosphere of the time. Can any readers help out? A year ago this rally drew hundreds of open neonazis. Today it drew twenty. They admit it’s because they don’t feel safe. This victory is due to militant and occasionally violent antifascist organizing. This proves, concretely, that antifa tactics work. The claim that “antifa tactics work” depends on where you think facism is to be found (and what it is). If you think that fascism in America is a Mussolini-style marriage of corporations and the state, then you might want to think about the implications of Jeff Bezos — also the owner of the Washington Post — getting a $10 billion contract from the Pentagon for data storage. Of course, the streets do involve that adrenaline rush, described vividly by David Graeber here (page 420 et seq). Power lying in the street? Nobody seems to remember Obama’s 17-city crackdown on Occupy. Or the National Guard in Ferguson, either. Oh, and let’s drop the fig-leaf that black bloc is just a tactic, mkay? “A Community-Run ISP Is the Highest Rated Broadband Company in America” [Vice]. “[Consumer Reports] surveyed 176,000 readers on their experience with their pay TV and broadband providers, and found that the lion’s share of Americans remain completely disgusted with most large, incumbent operators…. One of the lone bright spots for broadband providers was Chattanooga’s EPB, a city-owned and utility operated broadband provider we profiled several years back as an example of community broadband done well. The outfit, which Comcast attempted unsuccessfully to sue into oblivion, was the only ISP included in the study that received positive ratings for value.” • If the liberal Democrats wanted to appeal to rural voters, and weren’t owned by the donor class, and had any stones, they’d run on this. Of course, none of that is true, but we can dream…. Business news is quite light today, because there were so many political topics I wanted to write about. I’ll have a pantry clear-out tomorrow. NFIB Small Business Optimism Index, July 2018: “The Small Business Optimism Index rose by 0.7 points in July to 107.9, the second highest level in the survey’s 45-year history” [Econoday]. Import and Export Prices, July 2018: [Econoday]. The Bezzle: “Tesla investigates why bumper broke off two Model 3 vehicles after ‘heavy rain'” [Electrek]. • The teardowns mean that a Tesla car can be profitable. That’s not the same thing as saying Tesla can manufacture cars for profit. Tech: “Banks and Retailers Are Tracking How You Type, Swipe and Tap [New York Times]. “The way you press, scroll and type on a phone screen or keyboard can be as unique as your fingerprints or facial features. To fight fraud, a growing number of banks and merchants are tracking visitors’ physical movements as they use websites and apps. Some use the technology only to weed out automated attacks and suspicious transactions, but others are going significantly further, amassing tens of millions of profiles that can identify customers by how they touch, hold and tap their devices.” • Because of course they are. “Donald Trump is making Medicare-for-all inevitable” [Matthew Yglesias, Vox]. “Medicare-for-all — a government-run insurance program that everyone is either covered by or at least eligible for — is unequivocally the future of progressive health care policy…. [W]hether the Democratic Party should pursue it is no longer in doubt [lol]. That’s in part thanks to the work of activists and organizers who’ve been working in the single-payer trenches for years.” • You’re welcome. “Sorry, Bernie Is Right” [Matt Bruenig, Jacobin]. “But [the] initial success [of their propaganda campaign] slipped away from Mercatus because folks like myself quickly noticed that, buried in the report’s tables, the author had actually found that Sanders’s plan would save $2 trillion. That’s right: the same estimate with the scary $32.6 trillion figure they were promoting to all the journalists in the country also said that the US could insure 30 million more Americans, virtually eliminate out-of-pocket expenses, and cover dental, vision, and hearing care for everyone — all while spending $2 trillion less over the next ten years. After this was pointed out, the coverage of the report changed dramatically, and Bernie Sanders put out a video thanking the Koch brothers for their positive study…. Needless to say, Mercatus was not thrilled that its attempt to torpedo Medicare for All had become one of the leading talking points in its favor, and so it badly wanted a do-over. The preferred theater for their do-over was gullible and biased fact-checkers who they successfully coached into declaring that Bernie Sanders is lying using their inane truth-o-meter and Pinocchio-based measures.” • This is an excellent takedown of the Mercatus report, although I must say I prefer Yglesias’ “thanks to the work of activists and organizers” to “folks like myself.” Single payer has enormous intellectual capital, the result of a collective effort by many unsung heroes. “Fearing ‘blue wave,’ drug, insurance companies build single-payer defense” [The Hill]. “Health insurance and drug companies, who are often at odds on policy issues, banded together to form the [Partnership for America’s Health Care Future], which lobbyists say could run advertisements against single-payer plans and promote studies to undermine the idea…. Industry groups are worried that support for single-payer is quickly becoming the default position among Democrats, and they want to push back and strengthen ties to more centrist members of the party to promote alternatives. ‘Their worry is about 2020 and it’s becoming the litmus test for Democrats,’ said one insurance industry source familiar with the plan to create the new partnership.” • Not to worry, dudes. The liberal Democrats have got you covered. The DCCC is running enough Blue Dogs to make sure that single payer “never, ever” comes to pass, for at least one election cycle. And since the “Blue Wave” is going to break on the shore and, in due course, roll back without changing a thing, remind me why it’s important? The American public does not want our health care system decided by Pharma &amp; insurance lobbyists or invisible insiders. (For more on Slavitt, see “Andy Slavitt’s United States of Care: A Second ‘Undertaking’ (and It’s Bipartisan! )” at NC). Note the tell: “Conversation,” for which the operational definition is a bunch of “town halls” with NPR tote bag-carrying consultants using whiteboards to carefully guide a hand-picked audience to a predetermined market-based solution. And of course funding for focus groups, pollsters, strategists, video producers, as well as, these days, a troll army. “An analysis of out-of-network claims in large employer health plans” [Health System Tracker]. “Almost 18% of inpatient admissions by enrollees in large employer health plans include at least one claim from an out-of-network provider… Given these additional potential costs, why do enrollees receive care from out-of-network providers? In some cases, they may prefer a provider outside their network, maybe due to reputation, familiarity, or convenience. Sometimes, provider networks may have few in-network options for certain types of services, such as for mental health care. In other cases, patients may not be in a position to select a network provider, for example in emergencies or urgent care situations. Other instances of out-of-network service use may be inadvertent, such as where an enrollee encounters an out-of-network provider (maybe an anesthesiologist) in the course of treatment at an in-network hospital or surgical center, or when their in-network provider refers them to an out-of-network provider for services such as laboratory testing or radiology. These latter situations are sometimes called “surprise medical bills,” because patients may not have been aware that they were exposing themselves to the potentially large cost sharing and balance bills for out-of-network services. A 2016 KFF survey of medical debt found that among individuals who faced out-of-network bills they could not afford to pay, nearly 7 in 10 did not know the provider was out of network at the time they received care.” • Everything is fine. We have the best health care system in the world. “Austerity kills: this week’s figures show its devastating toll” [Guardian]. From last week, still germane. “When Protomammals Ruled Earth” [Scientific American]. “[T]he Carboniferous rainforests didn’t truly collapse. These lush, swampy habitats either moved or were replaced. It was a matter of turnover rather than a last stand of forest patches separated by inhospitable land. ” • Good news! 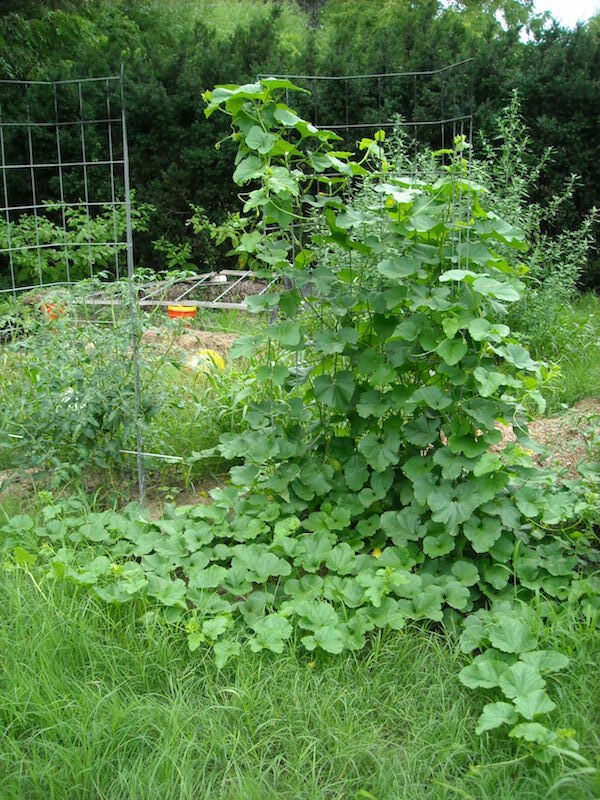 Two photos of the Chamoe vine at day 43 from planting. The first photo has roughly the same scale as the original. The plant has taken over; I gave up trying to train it about a week ago when the rains started. It had been growing steadily during the preceding multi-week drought, but really took off with multi-inches of rain over a week. 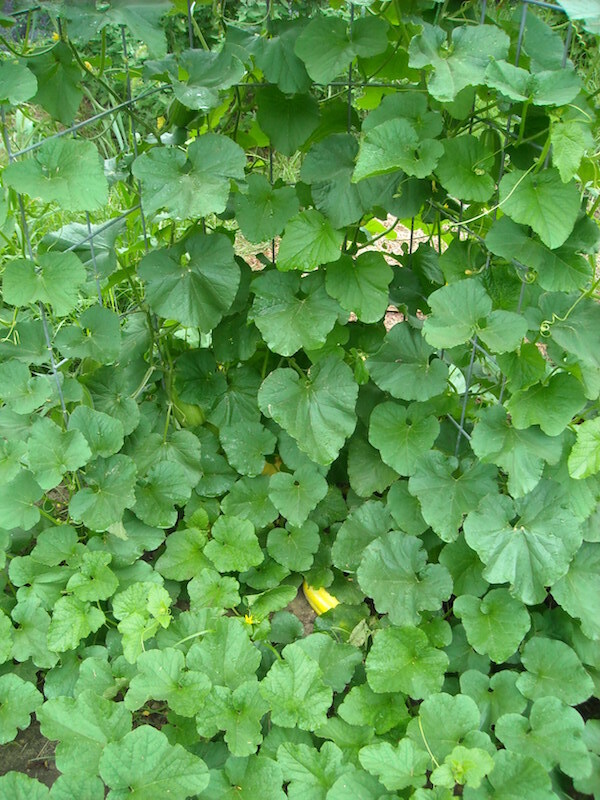 The first-fruit is visible toward the bottom of the photo, a yellow melon gleaming out from among the leaves. To get a sense of the scale of the plant, a second photo is attached. It has burst out of the intended trellis/cage and is spreading aggressively in all directions. I expect that it will overwhelm the cherry tomato vine (Riesentraube) to the left; I’ll have to decide whether I want tomatos or more melons. Perhaps I can guide the vines around the tomato. Given how aggressively this spreads, it might make a good shade cover over weedblock cloth to suppress the weed grass that is obvious at the bottom of the 2nd photo. I don’t know whether this is quack or bermuda but, whichever, it is getting the better of me. I expect that I will be digging the rest of the Summer, and into the Autumn and Winter. But at least I’ll have dug beds for timely planting in Spring 2019. And a stronger back. My quack grass has totally gotten the better of me. There comes a point, every summer, when I simply give up (generally because I’ve started projects that are more interesting than weeding). That point has now come. Also, I like photographs of projects. I’m running a bit short, so if you’ve got photos of a garden project, do send them in! Pollinators are good, too; so hopeful! This entry was posted in Guest Post, Water Cooler on August 14, 2018 by Lambert Strether. Worders of the world, unite against sloppy group synch or swim tactics on the vulgar! That Peter Strzok account is a parody – it actually changed names from @_peterstrzok to @notpeterstrzok, but not before plenty of people amplified this tweet. Chris Cillizza, for one. That’s where I got it. I’ll take it out, after noting that parody and real life are increasingly hard to tell apart. For example, the “Indiana Dad” following…. Tried to use ‘Strzok’ on a double letter score in a heated scrabble tourney last week-but was forced out, and had to eat the Z in the end. So, you strok out? That’s bad anywhere. The Twitter account may be a parody but the Peter Strzok Go Fund Me account is not. Can’t believe this creature has raised over $300,000. “RussiaRussiaRussiaRussiaRussia…” I can paste all day. Russia didn’t make 50% of the country poor and low income. Russia didn’t make 63% of the country unable to afford a $1000 emergency. Russia didn’t make us have unaffordable college and people buried under mountains of debt. Russia didn’t make the banks kick 5.1 million people out of their houses. Russia didn’t put us into eight wars with $700 million dollars going to our war machine at the same time we can’t get clean water in Flint. Russia didn’t poison our water in Flint. Russia didn’t frack our country. We’ve done all these things to ourselves. Russia didn’t stop Barack Obama from implementing a public option when he could have, at the snap of a finger. You know who did do that? His donors. We now return you to your previously scheduled fearmongering. Somebody should make a song about the “neoliberal disease” set to the tune of the Industrial Disease by Dire Straits. Kind of the same disease? Should this perhaps be $700 BILLION dollars? $700 million seems a little low. Indeed, during a flood…when the grass is inundated, geese love to stick their heads in the mud to get at the roots of such things. I’ve been experimenting with somehow penning them into a given raised bed to remove the corms of the bermuda grass that came with the free city mulch(it’s either that, or learn to live with bermuda as a living mulch. sigh). I’ll report on those results when they come in. another option, of course, is to let chickens in there during winter, while feeding them minimally. I finally convinced mom to do that, and it really cuts down on the bugs and weeds, come spring. Those are good strategies to know about, though I don’t think I would be allowed to keep poultry; perhaps if things get tougher (or the scary tick invasions get worse) the local rules will be relaxed. I’ve been digging up the deep weedgrass storage bodies, dehydrating them to death, and composting them. It seems to work really well to beat the grass back (for about a year) and the food plants seem to do a lot better in the deeply dug beds. You might be surprised. If the place is very old then chickens generally were allowed but people just stopped keeping them. If it is very new they probably were too busy deciding which colors you could paint your (fake) shutters and disallowing chickens didn’t even occur to them. for ticks, I hear tell you want to be nice to possums. 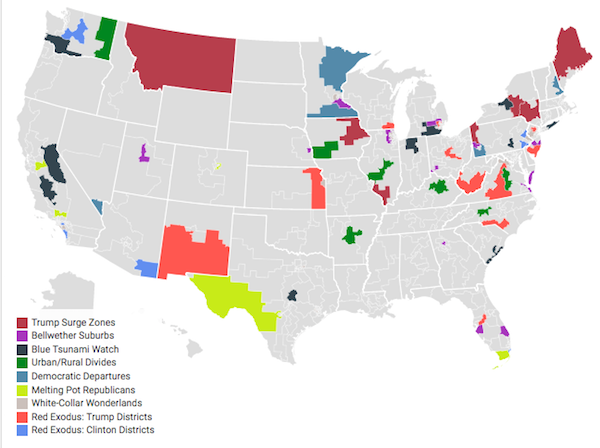 as far as HOAs and city ordinances…I feel for you. My brother and my dad live in those sorts of places. But I have determined that I belong at the end of a dirt road in the middle of nowhere. I’ve got around 30 geese, and I rarely hafta mow. and I know when something’s up outside,(all that honking and carrying on). and I’ve seen them kill a snake, and beat up a raccoon. Geese are also good for security. During the Vietnam war US troops would have flocks of geese herded outside vital bases as no Vietcong saboteur could get anywhere near the perimeter without the geese kicking up a fuss. Unless they were Russian geese. I created raised beds by digging a moat around where I wanted the beds to be and piling the dug-up soil onto the bed. Then I cleared the beds of grass. The roots of the grass surrounding moat could not grow down under the moat and back up into the bed. Once cleared of grass, the beds stayed that way. I remember in the 50s and 60s my uncle farmed a couple hundred acres of cotton in east Arkansas–the swampy delta part of the state–and during summer would rent flocks of geese that came with a portable fence in order to weed the cotton field. They wouldn’t eat the cotton because it tasted bad, but ate every other plant and also every bug. Another advantage was the free fertilizer from goose poop. What do you mean by the Democrats “thinking” of going low? Taking the low road is ALL THEY KNOW! Unless “Bernybros” was there way of being nice. The thing with RussiaRussiaRussia is that this was never really about Russian interference in the election, this is about the growing rebellion within the ranks of the Democratic Party. They want Bernie style progressive black listed. Re, The 2018 “Great Blue Purge” of the Internet. “…. But one book stood out from the others. It was called Ten Years of Uzbekistan. Looking inside Rodchenko’s copy of Ten Years of Uzbekistan was like opening the door onto the scene of a terrible crime. A major purge of the Uzbek leadership by Stalin in 1937, three years after the book’s publication, meant that many of the official portraits of Party functionaries in the album had to be destroyed. The concept of “personal responsibility” had been forced on the whole country by the Stalinists during a vast campaign of vigilance against the regime’s enemies. The names of those who had been arrested or had “disappeared” could no longer be mentioned, nor could their pictures be kept without the greatest risk of arrest. Petty informers were everywhere. The walls really did have ears. Rodchenko’s response in brush and ink came close to creating a new art form, a graphic reflection of the real fate of the victims. For example, the notorious secret-police torturer Yakov Peters (page 133) had suffered an ethereal, Rothko-like extinction. The face of party functionary Akmal Ikramov, veiled in ink, had become a terrifying apparition (page 129). And there, suffering a second death, was Isaak Zelensky, his face wiped out in one great blob and his name obliterated in the caption beneath. One really gets the sense that these guys can’t understand that most people never joined a Frat, and if they ever think about it, are glad they did not. Neoliberal paternalism leads to blinders. No, the plurality of the country is tired of your BS. Independents find both of you creeps. If you can afford to vote you’re mostly nowhere near A,N,&M,D as a single identity. When average joes feel it’s only appropriate to smack security cameras and feed a stick of wrigleys into the ATM, then we’ll be talking about angry. God, I’ve got Scott v Nelson. Imagine how ‘none of the above’ would do on that ballot. I would absolutely love to think I could nurse some Chamoe vines along next year in my mountain garden patch until late spring/early summer gets me to the warmer weather those things probably hanker for…but i fear the early season cold/damp would make a Chamoe very unahappy with me. I’ll have to give it a shot next year though – maybe I can make a cold frame or just start it out in the warmth of the apt before xferring it up to the mountain. In the meantime, LOVE the ongoing grow updates! Thanks! 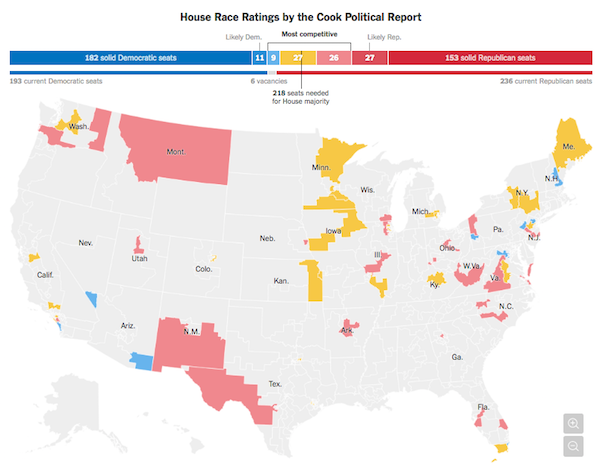 Something bugs me about the Cook political report. Why isn’t KS04 shown on the map? KS03 is shown, but why not KS04? I’m not tracking KS-04, probably because its PVI is +15 R.
So they can’t accept that Trump might actually not be a fool, but ascribed to Obama a failure of leadership by way of insisting it was Republican intransigence that prevented Obama from delivering the goods. So this is the reverse of failing to recognize that Obama simply didn’t plan on delivering; a failure to recognize that perhaps for his supporters, Trump actually is; and that that is what matters. Liberal Democrat supporters seem to have many blind spots. Behind every great blind spot you will find a great hypocrisy. Not only is Trump a fool, he is a fool with dementia. It is not the first time we had a foolish president with dementia. We just cannot come to grips with the decadent nature of our political culture. Other than bare conclusions, care to offer any evidence? From the long view of judicial appointments and military funding, he is anything but a fool. Dementia is a medical diagnosis requiring more than armchair quarterbacking. Not only is Trump a fool, he is a fool with dementia. Maybe so, oh mighty dcblogger. But if so, despite being a fool, Trump did a great job of taking down the Clinton and Bush political dynasties, and fifteen other Republican candidates. And despite being a fool — and a narcissistic monster, too, I will add — he was smart enough to pretend that he gave a *family blog* about the mopes in places like Wisconsin by going out and campaigning there, when Her Majesty — the other narcissistic monster — didn’t. Korea: Formal negotiations. That’s new. Syria: No US no-fly-zone and ensuing glow. Winding down. Indications you-know-which-state is down with that. Trade: Everyone is discussing the usefulness of shipping our sheetrock from China. And I think that is an excellent situation. NTDT: When the Democratic Party Leadership stops making hard-headed-Democrats defend Il Douche, they’ll be halfway to convincing somebody. HINT: Repeating your opponent’s NAME, over, and over, and over, and R!^3, over again is not best practice in publicity. –Unless you’re a Heel in a wrestling match. leadership™ conspicuously backed off on their calls for his impeachment? And also because Trump is holding up very well in the polls in the face of ongoing terrible press, much but not all of which is on target. Impeaching him runs the risk of motivating his base to vote R in November, even if they have some buyer’s remorse. That’s the talking point of about 4 months ago. Trump invited cameras into a 1+ hour meeting, unscripted, and he handled it very well. The dementia meme disappeared after that. By no means do I like or support Trump (quite the opposite) but I agree here on some Democrats having blind spots. If the Democrats want to have a chance and winning the presidency, they need to do a serious “lessons learned” on how they got it so wrong in 2016. If Russian influence actually affected the outcome, it was at the margins. The more consequential reason for losing in 2016 is nominating an incredibly flawed candidate with major liabilities and a significant disapproval rating within her own party. Top that off with the hubris that there was no way Trump could win and you have the recipe for a major upset. Thanks for the Gary Gulman bit. Of course I couldn’t find it…..because all traces of the documentary have been undocumented due to clues inadvertently exposed during interviews of the participants that the zip code is coordinates to be used by aliens when they invade. About Yglesias taking credit which is not his to take . . . . when typical establishment-figures like Yglesias struggle to run to the front of a parade in order to pretend they organized it and are leading it . . . you know the parade is trending. If we allow the Yglesii to take credit for these parades, perhaps they become emotionally invested in the success of these parades and will be less likely to double-cross these parades at certain key points in time. My favorite weathervane is Kirsten Gillibrand. No, did not read. Because MY. This is a good lesson in the danger of dangling participles, tho. Can we substitute ‘Constitutionally-Obvious’ for ‘government-run’ in the future? I’m in the ‘no card’ category for The Insurance; because you may have plague, and I’d prefer not to get it. Yglesias is, in fact, giving credit, and kudos to him. Read the post more carefully. One of the lone bright spots for broadband providers was Chattanooga’s EPB, a city-owned and utility operated broadband provider we profiled several years back as an example of community broadband done well. The outfit, which Comcast attempted unsuccessfully to sue into oblivion, was the only ISP included in the study that received positive ratings for value.” • If the liberal Democrats wanted to appeal to rural voters, and weren’t owned by the donor class, and had any stones, they’d run on this. Of course, none of that is true, but we can dream…. Why not use the same appeal to urban voters? I’d bet it would work to increase turnout, like turn non-voters into voters. Can’t figure out who that Kossack was and googling didn’t help (does it ever anymore?). Not Dr. Drew Linzer by chance? I’m really looking forward to reading the correct answer because a chart of Original Kossacks and where they are today would be damned interesting! Beginning in 2003, as his blog expanded to a community, Kos appointed four or five “guest bloggers” (also called “front page diarists,” “contributing editors,” “front-pagers,” and simply “FPers”) who are selected from the community and tasked with regular contributions on the front page (without needing to have their articles recommended or promoted). •	2008: brownsox; Scout Finch; smintheus; Jed L.
And CNN just magically stumbled on the story, right? Smells to me like an Atlantic Council plant. Well when Eliot Higgins started Bellingcat he was unemployed but now he is with the Atlantic Council with all the goodies that that entails such as consultancy work. Kaching! Maybe “Indiana Dad” wants a piece of that too. I wonder if based on the number of comments on Russia that I have posted whether “Indiana Dad” would target me as a Russian troll. Would he send me a snap of his gun? We have a name for people like that where I live. He would be called a f***wit. In talking about the now chubby Higgins, I see that he joined the Atlantic Council’s Digital Forensic Research Lab as Senior Non-Resident Fellow in 2016. Isn’t that the mob that Facebook is partnering to determine what is fake news or not? Hmmm. Kev, the article I linked to above is from 2003, so that dude was doing his thing a good 10 years before Higgins. There also were articles about him in WaPo in 2005 and The Atlantic in 2006. Like Higgins, he was an unemployed fat boy working from home. He is now listed (and has been for some time) as a senior fellow at the GWU Center for Cyber & Homeland Security, the advisory board of which is packed with IC and defense insiders. Yves posted a piece on May 25 that mentions their connections with PropOrNot, the Atlantic Council, and the new “partnership” with Facebook. Note that the first response to the FB announcement is none other than the dude in the 2003 article. No chance in Hades that this is coincidental. Nor do I believe it’s coincidental that hunting for Russian trolls on social media has suddenly become a popular hobby in flyover states. Susan Estrich: “Clinton fought hard.” Says it all, in so many ways. Maybe she meant “hardnocks” … as one who is hurled, like dead fish, into a waiting campaign suv …. No, Lambert is thinking of a Kossack. Trippi was with Dean then, but I’m convinced the first name was pretty boring like “Joe.” Someone like Howie at DWT would remember. He probably wrote about it. There is who I want it to be, but I know it’s not that person. Yosemite Valley opened again today, relieving the pressure on visitation here in Sequoia NP that came on account of the wildfires up north. Our NP’s are among the most cosmopolitan areas in the country, for sometimes it sounds as if English is a 2nd language, one of many competing for your ears. I’ve heard as many as 7 different lingua francas on a shuttle bus within the NP. During my last stay at Curry Village cabins in Yosemite I was surrounded by what seemed to be an entire French village. As happenstance would have it, my vacation read was The Ladies Paradise by Zola. Similarly, in Yellowstone any popular venue in summer is like a United Nations conclave. Out wolf watching one dawn a large party of Japanese were with us. When the wolves howled at dawn there were gasps, excited whispering and an old man danced and wept with joy. A lovely moment. I haven’t had the privilege of visiting Yosemite in a few decades. But the last time, it seemed that everybody coming downhill on the trail was speaking German. My wife and I decided that if we got to the top, we too would go through the magical Germanification ritual. We’re both mediocre students of the German language, and were kind of looking forward to gaining fluency. Unfortunately, it turned out that Germans just get up earlier in the morning than we do. So by the time we started going up, they were already coming down. It’s an exchange program where we visit their cathedrals and they visit our cathedrals. I’m not always Ken Burns’ biggest fan but I do agree with the title of his series: The National Parks–America’s Best Idea. The rest of the world seems to agree. Sadly our wilderness is getting to be a bit too popular for comfort. Mr. McPhee, Lambert had it in this morning’s links.I got it last week from a VA staff person, if you can believe that. I was much remiss in not sending the link right away to the good folks at NC. My excuse is that I was over my head in bureaucratic bungling, a good part of it by the VA (I, too, am a vet and disabled). In response to the ProPublica report, Democrats on the House Committee on Veterans Affairs called for an investigation and sent a letter to the VA secretary requesting documents. Their counterparts in the Senate also wrote to the secretary, but all they asked for was that he not cave to outside influences. The lack of media coverage is a bit perplexing. Must be that Three Guys from Mar-a-Lago isn’t as good for ratings as One Guy from Moscow. Perhaps the MediaLords support anti-VA privatization for social upper-class-loyalty reasons. Actually, I have sat through those hearings — many of them. I used to be a journalist in D.C., back when there was no live-streaming on YouTube, so you actually had to go to the hearing. You’re mostly right about them, with one noteworthy exception: Even when hearings are open, it’s all a dog-and-pony show to make it look like a public process, when in fact, all the outcomes are decided behind closed doors, sometimes before the hearing even takes place, and often as deals between congressional and agency staff and lobbyists. Via Dr. Faith Kearns Twitter. Dr. Kearns started a very interesting discussion on what Western summers used to be like before settlement, fire suppression, and climate change all acted to make today’s dangerous environment. Interesting, relevant California/Western history. But in the end, State Farm and the other Big Names were able to shed all the potential liabilities. The argument, after they reorganized their corporate structures (each state a separate corporation for losses, even though profits were still centralized) to put all the riskier bits in a small pool, preserving the more profitable ones for their big profit centers, was that it was unfair or something to make them eat losses that now looked so unbalanced. And besides, ‘what are you going to do about it, hmmm?” And so we have a small-pool state-run socialize-cost entity here now, and a very few private insurers writing homeowners insurance. Mark opened the meeting with a short power point presentation that included a time line of indictments related to the RussiaRussiaRussia obsession that he shares with his democratic party colleagues and most of his supporters. Alex Padilla then assured us that California elections were already secure despite Russian efforts to sow disinformation. He emphasized “cyber”security, but curiously admitted that it’s the California paper ballot that is the main reason we should have faith in our elections. The crowd applauded each reference to paper ballots from Padilla and all other speakers. Maybe the older crowd wasn’t as confident in the wonders of high tech security despite the prominence of smartphones everywhere. Padilla asserted that California elections are secure because the state uses paper ballots. Although machine counted, the paper trail allows spot check hand counts to verify the machine tallies. Another academic expert, D. Jefferson, told the crowd that Internet voting is a bad idea, and gave a short summary of the recent defcon meeting on voting machine hacking in Las Vegas. He largely echoed Stark suggesting there is no high tech fix for the ballot integrity issue. The last speaker was Mark Kunlelen, a graduate student at Claremont College. He rambled on about Russian bots effectiveness in using social media to undermine Americans faith in reality. Apparently the devious Russians bots even told people the wrong voting day or the wrong voting location. Unfortunately we can do nothing about this because the social media business model is sacred. However, we must still post the truth so others may see it. The Q and A was largely anticlimactic with nothing much said or observed. The one interesting moment was when Secretary Padilla said the Republican argument about massive voting fraud is a lie, further that voter suppression is rooted in white supremacy. This brought applause and one shout of “Thats a racist lie.” Mr. Padilla did not follow up on this, nor did any other presenter. The meeting closed with DeSaulnier calling for our continued vigilance and engagement, citing his faith in the intelligence authorities protecting us. In fact, he called Mueller a “providential” man, evidently imbued by a higher power to lead us from the wilderness. I was surprised that this didn’t get a stronger reaction from the crowd, but maybe it was getting too late. FWIW it was good to hear “experts” endorse paper ballots and downplay high tech. That’s an excellent link. Thanks. Skynet ate another comment. Shorter: read Beth Clarkson. Electronic vote fiddling has been going on a long time and has nothing to do with foreign actors. One of my big skepticisms with Ru^3! is that if an outside influence had actually changed the ballot, there would have been at least a hundred County Clerks found vacationing at the bottom of the river. Yes Beth did hard yards yonks ago. Hand-counted, not machine-counted is important. You’ve got to root out digital entirely, because you can never trust the software not to be gamed. Thanks for the report! (Mueller being “providential”…. This is cognitive capture, at the very least! Bearing in mind that the goal of all this is to hear the voice of the people (whose views and perceptions are subject to all kinds of daily manipulations by various powers that be) on the way to establishing a legitimate government. How does the mopery become secure against the stuffing, via ‘smoke-filled back rooms’ and their more genteel analogs) of the voting CHOICES that predates the stuffing of the ballot boxes, whether electronic tallies or actual hand-marked paper ballots, marked in private and hand counted in public? In Australia, anyone can attend the booth count as a scrutineer, and both major parties try to have a scrutineer at every count. If there is uncertainty about the voter’s intention on a particular ballot paper, the scrutineers may be asked their opinion about the pencil marks. If the outcome is close, a candidate may demand a recount, and sometimes there are two or three recounts before the result is declared. Today, on this, the 83rd anniversary of the signing of the Social Security Act, it pays to remember that, for the creators of Social Security, the reality of health care as part of what was broadly called “social security”—i.e., universally shared economic security—was never in doubt, and, in fact, they thought it was not too far away. The place where adequate health protection ought to be–and isn’t–is, after a health and decency wage, the biggest gap remaining in the security platform. At this point two separate planks are missing. One of these is sickness compensation against loss of earning power during temporary or permanent disability. This is akin to the sick-leave with pay which teachers and other Government workers have come to take for granted. The other is adequate medical care, including whatever medicines, treatment, and hospitalization are needed–a far more expensive proposition but one of the most profound importance. These are distinctive needs, and very likely we shall move toward meeting them on different but parallel paths–toward disability compensation along the lines recently laid down for social insurance against loss of wages due to unemployment or old age; and toward medical care along the lines of our long-established public health provisions. Adequate health protection may still be mostly pious hope. But it is not a vain hope; both of these measures are already on the horizon. What was viewed eighty years ago as “of the most profound importance” is now, again, viewed “unequivocally” as “the future of the Democratic Party.” I credit “the activists and organizers” mentions. (lambert is, of course, one of them.) The question (purely rhetorical for any readers of this blog) is why it was ever equivocal in the first place. the many (hopefully once and for all) that Team Blue will do *nothing* for them. I realize that can be read a number of ways. Oh man, looks like antifa are disingenuous as well as stupid. Actual antifa is centered around black bloc type thugs wearing hoods and masks (you know, the good guys! /s). When they aren’t out cosplaying as actual revolutionaries they’re engaging in internet debates about the moral permissibility of punching Nazis (those that aren’t undercover cops reporting to their commanding officer, I mean), as if this were some urgent quandary that needs to be solved. What they’re doing here is laying claim to the efforts of peaceful protestors who just don’t like racist dipshits. They’re completely silent and inactive both on the streets when it comes to actual police state actions (you link to Graeber, who was part of Occupy. Yet he and his beloved anarchists did exactly nothing when Obama’s paramilitaries crushed it), or either on or off the streets when it comes to resisting Wolin’s inverted totalitarianism. That I gather is a much more complicated, not to mention dangerous, beast to oppose. Much easier to just yell at some idiot skinheads around a Confederate statue and pretend like you’re a hero. I do wonder about “antifa”. COINTELPRO redux? Aame with the white supremacist/ neo nazi skinheads. Kyle Kulinski on the hilariously fizzled far right rally here. If you feel in need of a good laugh. Apparently there is some work towards diversity at the planning level. Unfortunately, if the rally was held in ID, 250,000 Neo-Nazis or White Supremacists would out number any rational or sane people. Less sinister conspiracy. More just grifters at all levels looking for the next payoff. Emphasized less than it could be is the commonality of this stuff. If their respective career moves hadn’t landed them in center stage of a 9 minutes hate campaign we’d probably be unaware of their existence.